The Tampa Florida area is always on the go! The highways, as well as residential streets, are full with drivers at any time of the day. Although beautiful, this busy city is home to not only traffic and road work, but also car accidents. And the more vehicles there are on the road the more traffic and accidents happen. 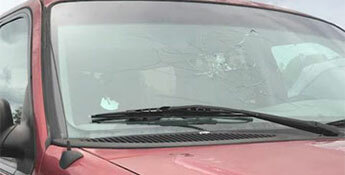 Many accidents result in needing a Tampa windshield replacement or windshield repair. If you should find your windshield is broken or chipped from an accident, road work or any other reason, we are here to get it fixed. The Auto Glass Warehouse is ready to get your Tampa windshield replacement or repair done right! In choosing us for your Tampa windshield replacement and repair needs, you are putting your windshield in great hands. The Auto Glass Warehouse has assembled a team of seasoned professional technician that have been working in the auto glass field for over 20 years. They are all trained in Tampa windshield replacements and repairs for all types of vehicles and all glass types. Not only do our technicians have years of experience, they are all NGA(National Glass Association) certified and follow all AGRSS industry regulations, to assure you a safe, quality windshield replacement on each and every auto glass repair and replacement they do. We want to be able to get you back on the road and quickly as possible. 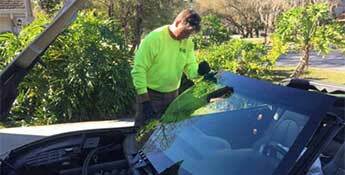 To do this, our friendly staff if ready to take your phone call for a your Tampa windshield replacement or repair. During your phone call, our staff will assist you in setting a appointment time and place, with free mobile service to wherever you are. A wet vehicle means a wet windshield and molding area. Your vehicle must be dry to properly adhere your new windshield. If you do not have a covered area to park your car under and there is rain, your appointment may need to be rescheduled. Before rescheduling to a later time during the day or another date, we suggest you check with a neighbor that has a garage or carport to borrow so you can keep the appointment time that is most convenient for you. Even though our technicians perform many installs every day, all windshields are done with extreme attention to detail. Our technicians will make sure to have each customer completely satisfied with each windshield replacement Tampa and all our other services areas. Be assured that along with the highest attention to detail, all of the technicians at the Auto Glass Warehouse are trained in windshield replacement for all types of vehicles. They are all also NGA (National Glass Association) certified, with numerous hours of on the job training. Having an NGA certification means that your installer has passed a exam that teaches agreed-upon standards in the field of auto glass repair and replacement. NGA is the leading certifier in the auto glass industry, providing a challenging certification program that remains current and viable. The NGA program always stays up to date on all the latest information and trends in auto glass. Call our friendly staff at the local Tampa office number today at 813-341-5549 to set up an appointment.